Phew, that was a real challenge and I’m really glad its finished. I’m very pleased with the way it came out, though I’ll admit I’m a tad disappointed that its taken up three days worth of my drawing vacation. Ah well – on to the next piece! 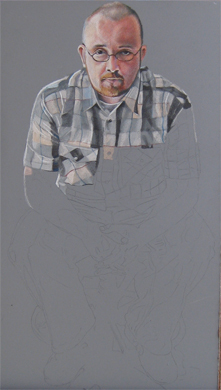 This will be the last in-progress post – the next will be the finished piece! This will probably be the last update for today…my hand is starting to cramp, and besides that its miller time. This isn’t moving nearly as quickly as I thought it would today…I keep getting distracted. Considering how long it took me to draw that section of the shirt, this may well end up being the “Week of Drawing Plaid”.